2 Dead, 2 Wounded In Nevada School Shooting : The Two-Way The shooter, described as 13 or 14, reportedly opened fire early Monday at the middle school outside of Reno. 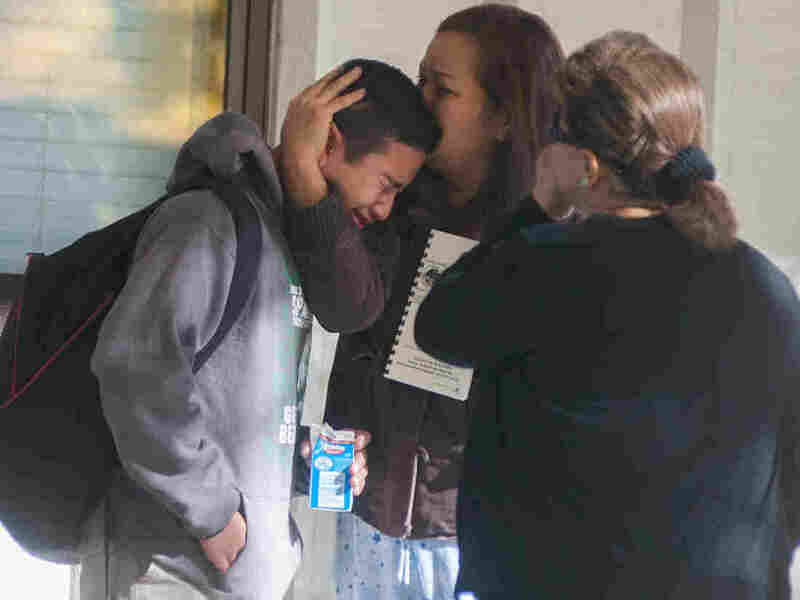 A Sparks Middle School student cries after Monday's shooting in Sparks, Nev.
A staff member at a Nevada middle school was fatally shot by a student, who was also killed, apparently by a self-inflicted wound. Two other students, both 12-years-old — were wounded but are now in stable condition, law enforcement says. The shooting occurred on the campus of Sparks Middle School in Sparks, Nev., a suburb of Reno on Monday before the start of classes. A witness reports seeing the staff member who was killed trying to persuade the shooter to give up the gun. The wounded students were being treated at a local hospital, officials said. "On Monday afternoon, one of the students was listed in serious condition and the other was in fair condition, hospital officials said." The adult killed in the shooting has been identified by his family as math teacher Michael Landsberry, The Associated Press reports. During a press conference, Mike Mieras, the chief of the Washoe County School District Police, said the suspected shooter was a Sparks Middle School student. Sparks Mayor Geno Martini said the shooting was an isolated incident. He said he was sorry that he had to be at the press conference talking about this, but "It's one of those things that happens." In an email to NPR's Ted Robbins, Aaron Kenneston of the Washoe County Emergency Management agency confirms there are two dead — the shooter and one staff member. In the video below, from the The Reno Gazette-Journal's website, Kyle Nucum, 13, describes hearing shots, then seeing a teacher approach an armed "13- or 14-year-old" wearing a Sparks Middle School T-shirt. "The student was pointing a gun at the teacher after the teacher told him to put it down. Then the student fired a shot at the teacher and the teacher fell and everyone ran away," Nucum says. The AP, quoting police, says: "The shooting happened on the school's campus, but outside the school building itself." The news agency says students at the middle school were evacuated to a nearby high school. "I was deeply saddened to learn of the horrific shooting at Sparks Middle School this morning. My administration is receiving regular updates and the Nevada Highway Patrol is assisting at the scene."